This encyclopedic reference/text provides an analysis of the basic issues and major aspects of bureaucracy, bureaucratic politics and administrative theory, public policy, and public administration in historical and contemporary perspectives. Examining theoretical, philosophical, and empirical interpretations, as well as the intricate position of bureaucracy in government, politics, national development, international relations, and a host of other institutions, the book focuses on the multifunctional role of public bureaucracies in societies with various socioeconomic, political, cultural, and ideological orientations and covers a wide range of processes and subjects. 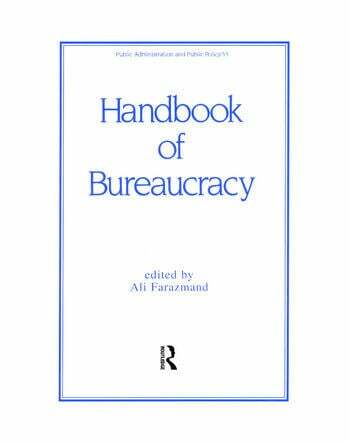 "It is not very often that one comes across a book which is so comprehensive in its ken, so incisive in its analyses and so rich in content, all at once-the book under review 'Handbook of Bureaucracy' fits all these descriptions like a glove. It contains forty-three essays on myriad aspects of bureaucracy, each written by a specialist…The book just about covers everything that there is to know about bureaucracy." "…a very useful reference tool for students of public administration."